I am thrilled to finally share this enlightening interview that I did with Mollie Engelhart, co-founder of KindKreme (originally called Nice Cream). This was shot soon after the raw, vegan, organic dessert shop opened this summer, and they have been receiving rave reviews since that time. This is the first entirely vegan "ice cream" shop that has opened in L.A. - very exciting! However, some of the products do contain honey, which many vegans do not consume (check out the video to learn why they use honey). I tried all of the non-honey flavors, as well as the soft serve, and they were all fantastic. 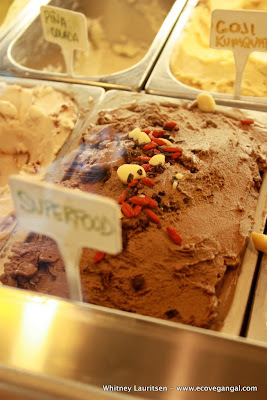 Superfood was my favorite - loved the chocolate with the crunch of the goji berries and nuts. It is rare to feel energized after eating dessert - that's the beauty of KindKreme. Not to mention that you can leave feeling guilt-free, as the ingredients have been carefully selected and considered for their health benefits, not taste alone. In the interview, Mollie talks about her inspiration for opening the shop, the ingredients used in the products (and why the prices are "high"), how the business is eco-friendly, and the controversial topic of honey in the vegan diet. Mollie has quite a family: her father owns Cafe Gratitude (one of my favorite restaurants - review coming soon) and her brother made the documentary May I Be Frank (which she excutive produced). KindKreme recently announced that they are opening a second location in Pasadena! Find KindKreme on Facebook and Twitter.